End of Year ACT HTA Party! 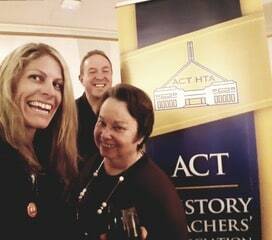 The end of year party is the chance for all active members of the ACT HTA to come together to be recognised, to network, and to relax and socialise as a group of dedicated volunteers from across so many areas of the capital who work for the association to support history education, community connections and raise the profiles of each. To request information and rsvp, contact the ACT HTA President via the contact tab on the front of this web site. Prizes for ACT HTA members who rsvp that they are bringing a new, signed up member (for both attendees!). Our President, Secretary and committee member Sarah Warren, at a recent Movie Night !